UPDATED Ofcom has begun a consultation over the proposed changes to local DAB digital radio coverage and frequency changes. Stakeholders in DAB digital radio agreed on a plan to launch additional DAB transmitters, extending coverage of local radio on DAB, earlier this month. The consultation document seeks views on a set of requests to change the frequencies and/or areas to be served by some of the local DAB multiplex services in the UK. Frequency changes are required to be able to boost coverage without interfering with other local DAB services in other regions. Interested parties can view maps within the consultation document showing which areas will be officially served by the network of local DAB multiplexes following the changes. These 'licensed area' maps are different from coverage maps, showing the official editorial area served by the multiplex. Notably, some areas that were officially served by a certain local DAB multiplexes may now fall under the area of another multiplex - the London multiplex licensed areas shrink to the south now that Surrey DAB is on air, while the licensed area for the Norwich local DAB multiplex expands to all of Norfolk, although there are no current timescales for an expansion into West Norfolk. The multiplex serving Bath and West Wiltshire has a major shift to the east - Bath, served on the Bristol and Bath multiplex, falls out of the licensed area, while Salisbury moves in. Detailed coverage maps, which provide a more useful view of future reception areas and which show the impact of the additional transmitters that will form part of the local DAB multiplex expansion are published on the Ofcom website. Ofcom advises that the DAB frequency changes in some areas, "if agreed, will require some listeners to retune their DAB digital radios. The proposed area changes are primarily administrative, and would not affect the services that currently can be received in any given local area." A list of the multiplexes that could be affected by frequency changes is found here. Interesting that the editorial areas have been changed to cover the likes of South Wilts, North and West Norfolk, Lancaster & Morecambe without providing transmitters to actually bring a service to these areas. 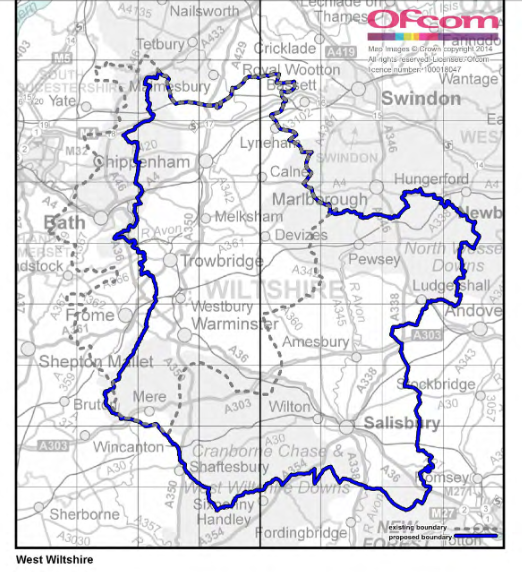 As you say, Bath is removed from the editorial area of West Wilts, but the transmitter remains and the area is still covered, so some of the changes are meaningless. Together with the areas previously mentioned and other substantial gaps in coverage, large areas remain with no local DAB provision whatsoever such as Cumbria and much of Wales and Scotland. The question now is how will the BBC migrate the national radio stations for Wales, Scotland and even N. Ireland from AM/FM to DAB without comprehensive coverage on the local DAB network?